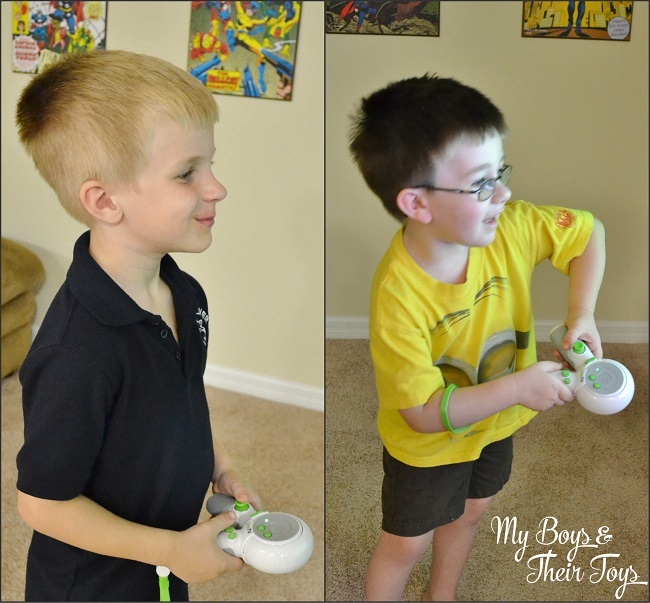 As you can see from those smiling faces, the boys are having a blast playing LeapTV! 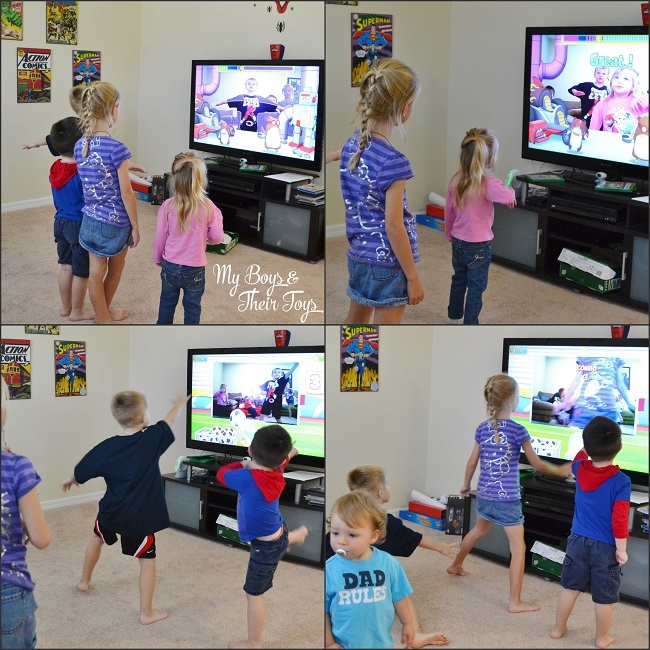 Our LeapTV kit also included 2 additional games: LeapFrog Sports and LeapFrog Dance & Learn. By the end of 2014 LeapFrog will release over 100 educator-approved games and videos! LeapFrog Sports includes 9 games, including skateboarding, soccer, baseball, and even karate. 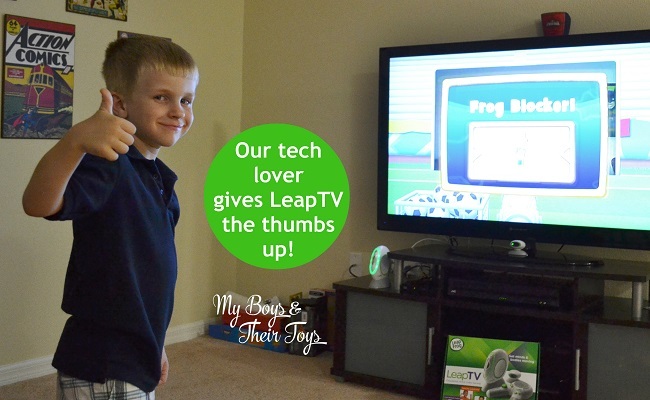 Check out L testing out LeapFrog Sports in this video. 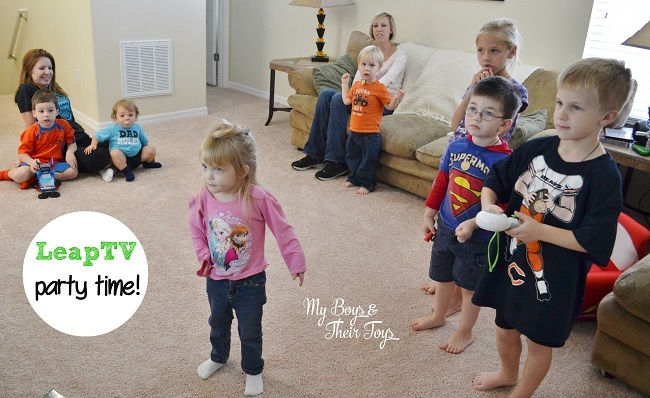 LeapFrog Dance & Learn includes 9 educational focused dance games. Both games allowed for up to 4 players to enjoy the game while competing against each other in educational challenges. What’s included: Console & Stand, Motion-Sensing Camera, Transforming Controller, HDMI Cable, Power Adapter, and optional Camera Mount. The LeapTV system gets kids into action while teaching core skills across reading, mathematics, science and problem-solving. Games adapt to each child’s level-starting with age, then automatically adjusting the learning for the right challenge. Designed for kids ages 3-8, the LeapTV video game system changes the way children learn by combining activity and movement with educational curriculum. There are 3 unique ways to play: Body Motion, Pointer Play and Classic Control. I really appreciate the safety features, like including a wrist strap for kids when using the transforming controller. The game also provides step by step instructions within the game and reminders for kids and parents. Think LeapTV is perfect for your child? Learn more about this educationally focused gaming system at leapfrog.com. It comes highly recommend by this mom! This educational gaming console is available at Walmart, Toys R Us, Target, and online at leapfrog.com and amazon.com . Looks like everyone has a great time! Looks like a lot of fun and educational for kids in all age groups! We had so much fun with our Leap TV. I love that it takes so many skills in such a fun way. I love that it’s educational and easy for the younger ones to do. It looks like they had a blast with LeapTV. With the weather cooling, we’ll be spending more and more time indoors. Interactive fun is going to save us this winter. I’ve been eyeing this! It looks so cool! My kids (and their friends) are absolutely loving the LeapTV. I have already been asked if we can get more games! We just played this a couple weeks ago. My 6 year old was loving the rope climbing game and I think my 2.5 year old would have a blast. I had no idea that this even existed. This looks like a great way for game night that even the little one can join in. I’ve been a fan of LeapFrog for a very long time. This looks like a lot of fun and they did a good job getting kids up and moving – and learning at the same time! First of all, I have to say the kids are absolutely adorable! This looks like such a fun party. The best part is that it keeps them moving. Their faces show they’re having a blast! I’ve come across this 3 times today. Maybe the big Christmas gift this year? All the kids look like they are pretty enthralled by the leap tv. I didn’t know they had a system like this for kids, it looks like a lot of fun was had by all!